Shade structures are one of the best ways to enjoy your Dallas backyard. With a little shade you can transform a bare patio or yard into a comfortable outdoor living space. But not all shade structures are created equal. There are pros and cons to each style and material of shade structure, and you’ll have to consider them carefully to choose which type of shade structure is right for you. One of the most important considerations for a shade structure is the material it’s made of. Different materials offer many advantages and disadvantages including durability, price, and ease of installation. One of the simplest and most common materials for shade structures is fabric. Fabric is a good material for simple shade structures, but it’s not always appropriate for a permanent structure. There are many ways you can use fabric to create shade in your backyard or on your patio. Some of the most popular ways to use fabric for shade include umbrellas, fabric awnings and shade sails. Fabric has several advantages for shade, including ease of installation and many different available colors and styles. It’s one of the simplest ways to create shade outdoors, and it also is inexpensive compared to other shade structures. The problem with fabric as a shade structure is that it’s much less durable than a more permanent solution. Fabric shade structures must be put up and taken down each year, and they should also be taken down before any heavy rain or storm. Not doing so risks letting the fabric stretch, tear, or blow away. Fabric structures also need more frequent replacement than other shade structures do. Another popular option for shade structures is wood. Wood shade structures are extremely flexible and can look great, but they still have some problems you should be aware of. Many people choose wood for their outdoor shade structures, and there are plenty of reasons why. Wood shade structures can be relatively inexpensive to build, very attractive, and can match almost any style of home. They’re also flexible – you can use wood to build a pergola, a gazebo, or even a covered patio. Unfortunately, wood also has some drawbacks you should be aware of. The biggest one is durability. Compared to shade structures made of metals or vinyl, wood is far less durable and long-lasting. Wood shade structures break down over time due to moisture and weather exposure, and they’re also susceptible to pests like termites and ants. Plus, wood shade structures require lots of regular maintenance including staining, cleaning, and repairs. If you want a structure that is extremely durable, it’s possible to build a shade structure out of aluminum or steel. 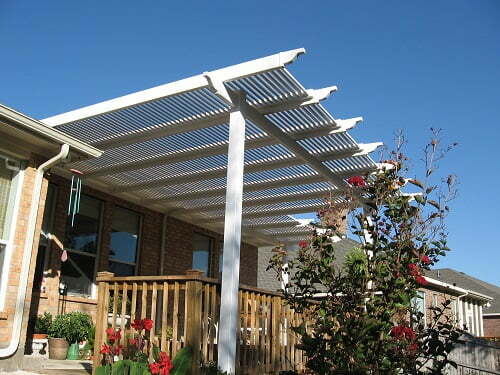 Metal shade structures are popular especially for awnings or patio covers attached to the house. But like other materials, they are not without their drawbacks. The biggest advantage of metal for shade structures is strength. Aluminum and steel are very strong and lightweight, making them great at standing up to weather and time. They are also very corrosion-resistant, and you can build metal structures in many colors and styles. One disadvantage of metal shade structures is cost. While aluminum shade structures are priced competitively with other materials, steel can often be more expensive. Also, aluminum and steel need regular maintenance to keep them in top condition. Finally, if they are ever damaged, repairs to steel or aluminum structures can be challenging. Finally, vinyl shade structures are becoming increasingly popular for homeowners. Vinyl structures have several unique advantages that make them a great choice for shading your backyard. Vinyl’s biggest draw is its durability. Like aluminum and steel, vinyl is extremely strong and very corrosion-resistant. It’s not vulnerable to pests, and it also won’t break down over time from weather or sun exposure. Vinyl shade structure owners can also add different accents or left with straight, clean lines to suit their preferences and style. Vinyl shade structures are somewhat more expensive than wood or aluminum structures, but they’re also stronger and more durable than any other material. For most homeowners a vinyl shade structure is a lifetime product – it will last as long as the house it sits beside. Whether you like the classic look of wood or the durability of vinyl, Future Outdoors can help you create your perfect outdoor shade structure in Dallas, Texas. We build gazebos, pergolas, patio covers and more, and we’ll customize your shade structure to suit your needs and style. Call (972) 576-1600 today to set up your free quote. Or, visit our Facebook page for more outdoor improvement ideas from our expert team.